I'm in for an extra treat! When I initially set out to get a sit-down long arm, my favorites were the HQ Sweet 16 and its twin, the Baby Lock Tiara. I was leaning toward purchasing the Tiara simply because there is a good Baby Lock dealer located about 30 minutes drive from my home. A new HQ dealer shop was going to open but that would be 90 minutes drive from home. Then, I find a year-old HQ Sweet 16 for sale, and it became the one for me. Fast forward a month, and the new HQ dealer in Fredericksburg, VA has just opened. The store is The Crazy Cousin and it is a brand new shop owned by Rhonda Trahern. I had her info from the Sew Expo, and found her on Facebook as well. Her website is still under construction, but the feedback on Facebook is great. 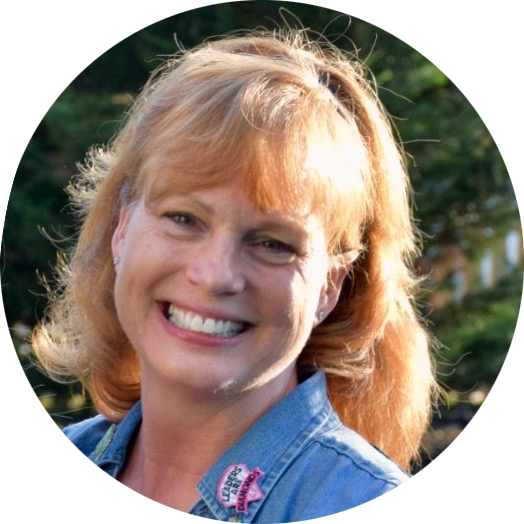 We've communicated via email, and she has been so helpful - even in the midst of starting up her new business. I know this is a Tiara, but it is the same machine as the HQ Sweet 16. This photo shows the table overlay in place. I was looking to get the Table Overlay for the Sweet 16 from Rhonda, and also asked about any upcoming TruStitch pricing for the holidays. She was able to offer me a bit of discount on the TruStitch - which was the same price that was available at the Sew Expo. But, the exciting news, is that HQ is having a Fall Special! 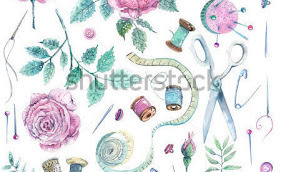 HQ is including the Table Overlay for free with the purchase of the TruStitch. So, now I'm getting the TruStitch plus the Table Overlay - for one reasonable price, and having them both shipped to me directly. 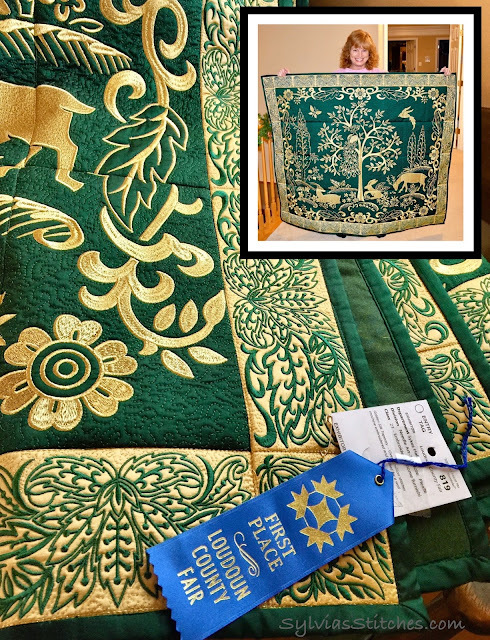 Although I would love to meet Rhonda in person, and check out her new quilt shop The Crazy Cousin, I'll save the visit for a time when we are driving out her way. Sweet 16 made prior to April 10, 2012 require free software upgrade. One issue for me. I watched the HQ Webinar for the Sweet Sixteen. 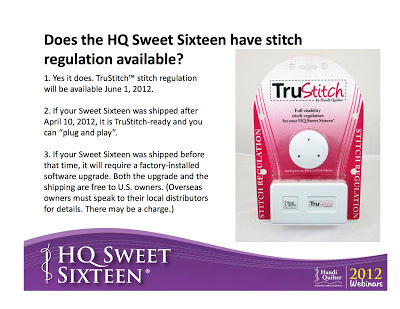 One of the slides presented indicated that if the Sweet 16 was manufactured before April 10, 2012, a factory-installed software upgrade is required to support TruStitch. The upgrade and shipping are free to U.S. owners. Since my machine is one year old, this is something I need to take care of before I can actually use the TruStitch. Rhonda at The Crazy Cousin has said she will try to take care of everything with HQ for me when she sends the order in. I heard that it may take a couple of weeks for HQ to actually complete a machine upgrade, so I better try and quilt the couple tops I have ready to go first. Isn't it exciting? Congratulations to you! Thanks Michelle! I'm really looking forward to it! Wow. Sounds like you found the right shop to work with for your machine.